Julia Wong is a Los Angeles-based international interior designer recognized for her luxurious and elegant residential and commercial interiors and exteriors. A creature of urban settings and global travels, Julia is widely recognized by design aficionados and media giants for her captivating residential and commercial interiors and exteriors. Having worked in London, Hong Kong, Tokyo, And Los Angeles, her contemporary renditions of luxury and elegance have earned her a reputation as one of the top designers from around the world. A British native, Julia is fluent in French, Mandarin, Cantonese, and Japanese. Julia studied design at the Ravens-Bourne School of Art and Design in London. She worked under the renowned fashion designer John Galliano. Her international travel and diverse experience served as a foundation for Julia's elegant yet effortless aesthetics fusing European tradition and American lifestyle. Focusing on the American market, Julia moved to Los Angeles in 2000, where she added businesses and residences of Malibu, Pacific Palisades, Calabasas, Brentwood, and Beverly Hills to her international clientele. 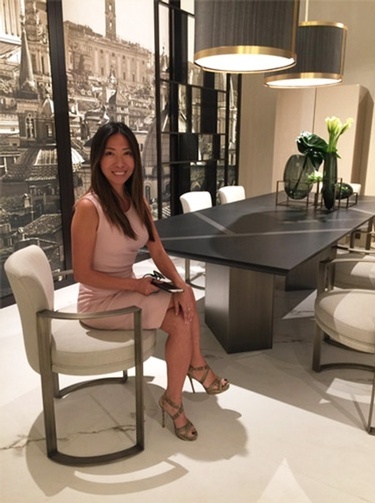 To provide her clients with a more holistic approach to interior design services, Julia is also the namesake and creator of a signature product line, Julia Wong Designs. Julia’s retail experience includes North America, Europe, and Asia-- ranging from custom couture designs to designs for the mass market, including putting together lifestyle/fashion collections, merchandising, and manufacturing for some of the finest collections. She was invited by Haute House to launch its first high-end designer collection at High Point Spring 2007. The collection was well received by major chains such as Neiman Marcus, Horchow and Baker featured on the cover of Furniture Today. As a result of her efforts, Haute House was selected by Neiman Marcus in 2008 to be its exclusive manufacturer. Subsequently, Julia was hired by the manufacturer “The Rug Market” to introduce the Walt Disney Signature Rug Collection for Fall 2008. Julia approaches each client individually. “It is very important to listen to the client and understand their lifestyle,” says Julia. “That is my starting point." Her objective is then to infuse elegance and warmth by designing comfortable spaces for her clients. Julia's effortless, stylish interiors and home furnishings are recognized by The Wall Street Journal, and Traditional Home magazine featured Julia's project.